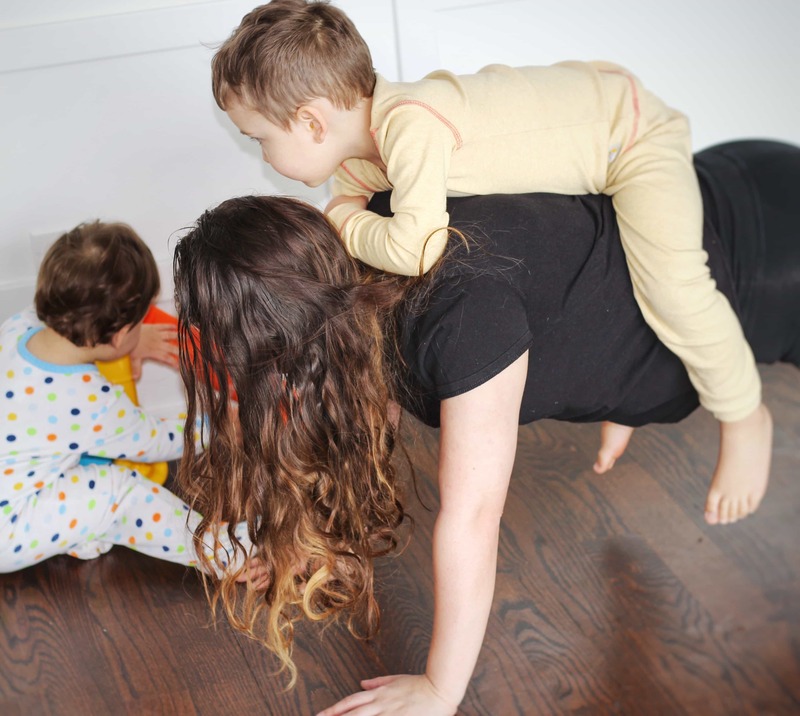 How to Exercise with the Kids at Home & Still Have a Killer Workout! Let’s be honest, getting to the gym can be nearly impossible when you have kids at home. But, what if you didn’t have to go to the gym? What if you could get a killer workout and exercise with the kids at home? The key is to take advantage of everyday chores and activities and incorporate them in to your exercise routine. I promise you that if you do this, you will sweat and you will sweat good! Since you’ll be getting a good sweat in throughout your day (and so will your kids), It’s also important to get the stinky smell out of those clothes. 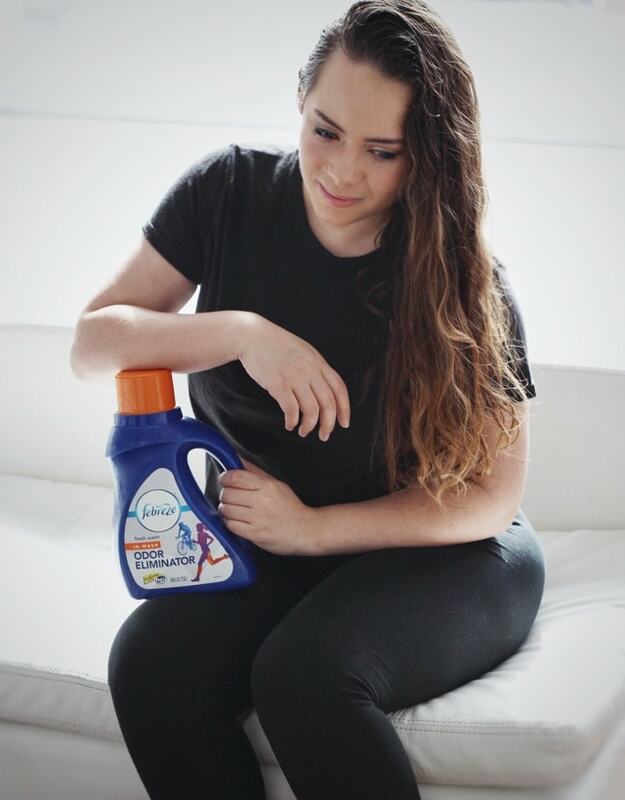 My secret is Febreze In-Wash Odor Eliminator, but don’t worry, I’ll talk more about how to wash those extra sweaty workout clothes once we get you sweating! Wear your favorite workout gear because it’ll motivate you to get these workouts in. When you look good, you feel good. 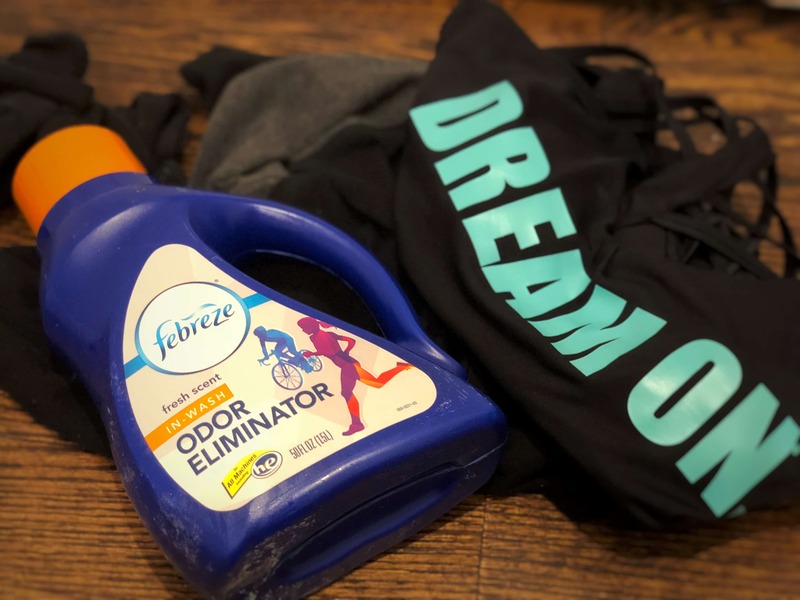 And when you feel good, you do great things (like torch calories)!Make sure you get some Febreze In-Wash Odor Eliminator to keep your favorite clothes looking new and smelling fresh after you spend the day working out in them. Have a dance party for cardio. I don’t know a kid that doesn’t love to dance and it’s a great calorie burner. So play some music, grab your kids and just dance! Bonus points if you dance while carrying one of your kids- that is weighted cardio… for free! Use what you already have at home as equipment. You don’t have to buy fancy equipment to get your sweat on. You have plenty of things in your home that can double as workout equipment. Some examples? Laundry detergent instead of dumbbells, a chair instead of a bench, a towel instead of an ab roller... and the list goes on. Use your kids as weights. Seriously, the kids love it and it makes for a great exercise. Plus you get that warm and fuzzy feeling of bonding with your kiddos while exercising. And if your kids are anything like mine… they’re heavy! Let the kids play while you exercise. 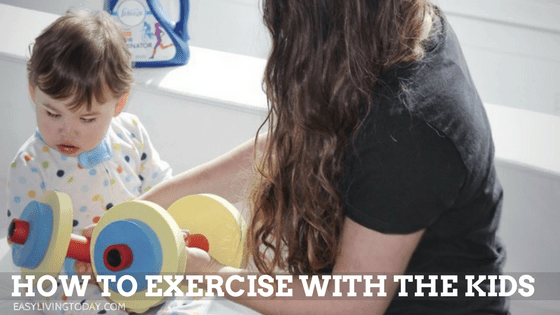 If your kids just wont cooperate, are too heavy or would just rather not participate, let them play with their favorite toy while you exercise. I like to hide a few toys and only bring them out when I need to get a workout in. It makes the toy special and new so it can usually keep them busy for the entire 30 minutes – 1 hour. 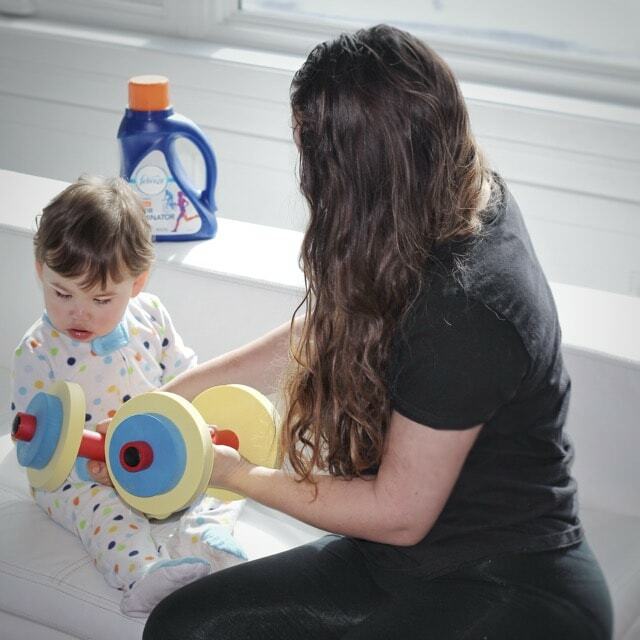 Exercise while doing regular chores since you do them with the kids around anyway. Instead of just washing the dishes, squat and lunge while you wash them. Instead of just folding laundry, get a quick workout in while you’re folding. You can even workout while you watch TV! These things that take up time during your day can double as times to workout. So, obviously, working out all day throughout the day is going to mean lots of sweat for both you and your kids. But don’t let that stop you, because you can easily get that funk out of all of your clothes with just one wash! Just throw all of those clothes in the washer with your favorite detergent and add Febreze In-Wash Odor Eliminator. This seriously gets the stink out of even the toughest odors like sweat, boys smelly socks, mildew from leaving the clothes in the laundry too long, pet smells or smoke/fire. It replaces that funk with a fresh scent that just makes you smile for some odd reason (or am I the only one that loves the smell of fresh laundry?). The best part? After washing your clothes with Febreze in Wash Odor Eliminator, they will smell good the entire day. It doesn’t cause any fading either, so your favorite, neon activewear will still look new and smell better than new for a very long time. That’s my little secret, so go get some and thank me later! ==> Get Febreze in Wash Odor Eliminator today! Now go grab your kids and get your sweat (ahem, sparkle) on! *** DISCLOSURE: I was compensated by Febreze In-Wash Odor Eliminator for this post but the content and opinions are 100% my own.